Before I add my picture, or write the accompanying words, I want to refer any readers to our week 1 theme of Project 52, and specifically to Bonnie’s heartfelt picture and her beautiful words which touched so many of us. The essence and meaning for everyone is essentially, and in all ‘simplicity’, that life is about those whom we love the most, about family and friends, and we should treasure them every day. My friend, and ‘partner in crime’, Bonnie, will be back next week. The subject I chose to photograph this week reflects a simple childhood pleasure, one that I’m sure that I share with many. I would think that one of the first things most children in England learn to cook are fairy cakes. 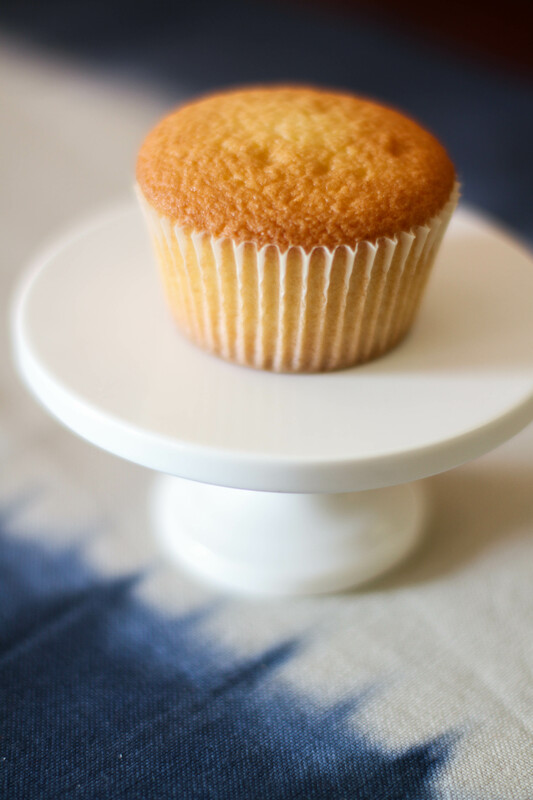 Certainly every birthday party of my childhood wasn’t complete without a plate of these lovely, buttery cupcakes. To my American friends, they are probably the cake equivalent of shortbread, but light, scrumptious, and definitely best eaten warm and straight from the oven. A quick list of ingredients; 4 1/2 oz’s each of unsalted butter (at room temperature), self-raising flour (sifted), and finely granulated white sugar, 2 eggs, 1/2 teaspoon of vanilla, 2 tablespoons of milk. I usually double the amount, 12 is never enough in our house. Cream the butter, add the sugar and whip until light, add the eggs and mix until fluffy, then add the vanilla, milk, and then gradually add the flour. Divide equally into about a dozen cupcake cases placed in a muffin tin, and then bake in the middle of the oven at 375 degrees for about 12 minutes, when a toothpick should come away clean from the middle of one of the cakes. Put the cakes onto a cooling rack, and try not to eat them all while they’re still at mouth-burning temperature. They are so wonderfully, buttery delicious, no topping is necessary they are simply perfect as they are. I’m a super reluctant, totally untalented cook, but they come out perfectly every time and the house smells dreamy. As an additional note, my husband ate the most in one go when I made the batch this afternoon, he claims it was only 6 but I’m deeply suspicious. I took this image at around 3 o’clock this afternoon, in full sun at our breakfast table. I used my Canon 7D with my 50mm 1.4 lens attached. My camera settings were ISO 100, aperture at f/1.4, and shutter speed 1/100. Post processing in Lightroom 4, I increased the contrast, and the clarity a little less so. I also decreased the highlights. When can I come have a cupcake? And yes Bonnie’s words on that one was amazing!